Friends and family regard me as a bit of a boat bore. My fascination for all things floating dates back to my childhood and a father who was a keen sailor. Indeed, all the holidays of my youth were spent, come rain or shine, on a comfortable 36ft ketch. Later on as I started to earn money of my own, I was able to pursue my interest more voraciously. 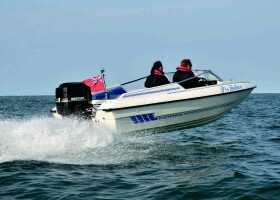 My first boat was an 18ft Ring with a huge Mercury outboard that I used for water- skiing in the Bristol Channel. It did almost 80mph and burnt through a 25-litre tank of petrol in under 15 mins. But what a boat! 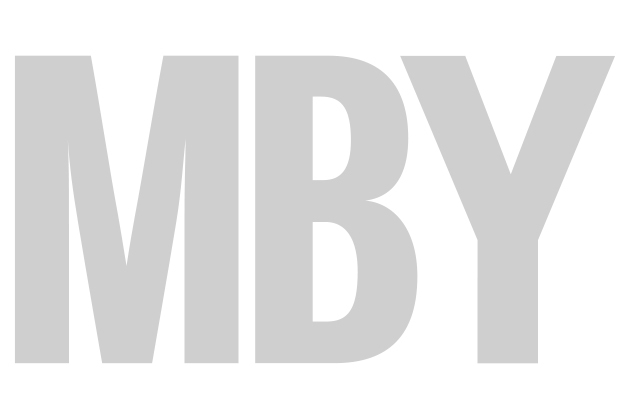 I loved it, even if the girls who were meant to be impressed by it were invariably appalled. 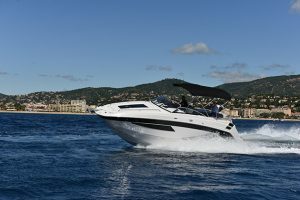 It wasn’t until my late twenties that I discovered, thanks to my beautiful Dutch wife, that there was a whole world of boating fun to be had in the South of France. We rented a flat in Villefranche and purchased a 28ft Cranchi Corallo. We had a lot of fun in that boat and managed to sell it for more than we paid for it, a notable but never to be repeated achievement. 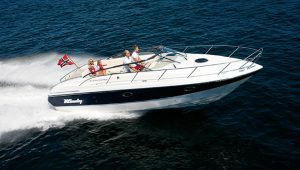 Subsequent upgrades included a Monte Carlo Offshorer 30, a Cranchi Aquamarina 31, a Cranchi Endurance 33 (the only new boat I have ever bought), and the then flagship of the Cranchi range, the Mediterranée 50. 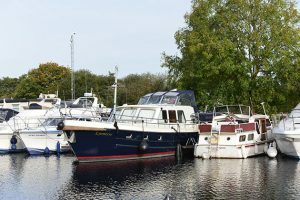 All of the Cranchis were great boats, designed for a specific purpose, built to a high standard and extremely well priced. Most of the time we used them as glorified day boats with friends and my growing family. The Med 50 was the one boat that we did sleep on occasionally, but a disastrous week of rain one half-term dented the rest of the family’s enthusiasm for cruising and we reverted to dayboat use once more. 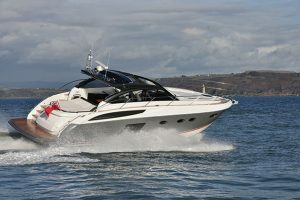 A brief flirtation with a 1986 Riva Bravo proved to me that an old boat was not necessarily a bad boat: the build quality was second to none and she ran like clockwork. 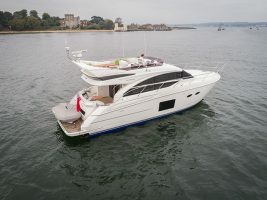 But I wanted to try the ‘cruising thing’ again and for three years I owned a wonderful Ferretti 57 that we used to explore Sardinia, Corsica and the Italian and French rivieras. However, as our children grew older, our time became more constrained and I again found we had started to use her as a dayboat. 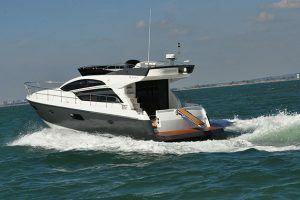 This made no sense given the costs of running a big boat in the South of France, so my thoughts returned to finding the ideal dayboat. 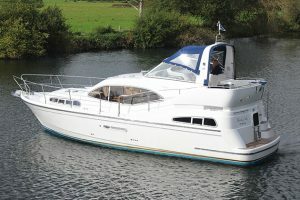 It needed to sit eight people for lunch around a table, have plenty of sunbathing space, a decent heads and the ability for four of us to overnight as and when. Crucially, I wanted more speed to get us further afield in less time. 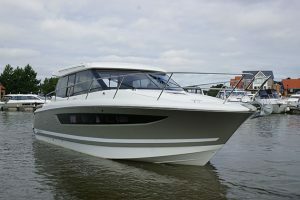 Plenty of boats met the criteria, including models from Windy, Princess and others but my now boating-wise wife decreed that she didn’t want one “that looked like everyone else’s”. I liked the idea of an Axopar 37 but she didn’t like the loo being in the main cabin. The Rivarama 44 was perfect but too expensive. The Mochi 51 was too big. The Itamas and Pershings were only fast enough over a certain size and budget. A couple of friends had had good experiences with Huntons but I couldn’t find a 43 at a price I thought reasonable. 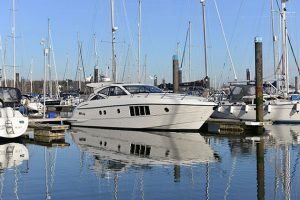 In the end, I concluded that I couldn’t find the ideal modern boat so I began to consider buying an older, less expensive one and refitting it to suit my needs. 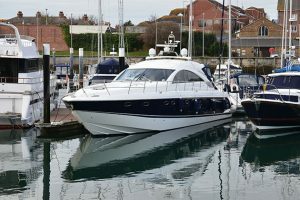 I looked at Magnums and even an OTAM but, again, couldn’t find the right boat at the right price. 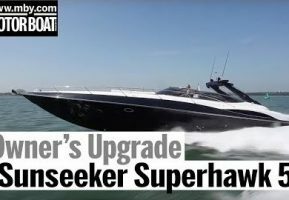 I ruled out the Sunseeker Superhawk 34 and 40 as too small but then I remembered that they made a 50 with fixed Trimax surface drives. 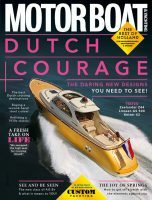 Before long I was looking at one in Holland fitted with triple Yanmar 420hp motors. 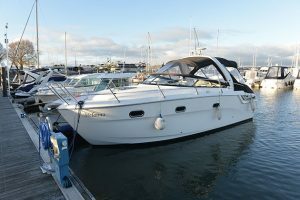 The boat seemed in good condition but a subsequent viewing with a mechanic highlighted a significant problem and I walked away. In June 2017 I found another 2002 example located in the toe of Italy. It was in very good condition and had a full mechanical history. 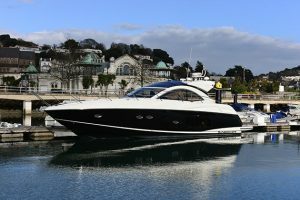 I agreed a price of around €110,000 and arranged for a delivery skipper to bring it back to St Tropez, where we enjoyed it for the summer with the idea of refitting her over the winter. 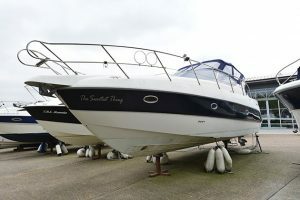 The first step was to identify what was good and bad about the boat. Everything worked and the engines were reliable, if a little unloved. 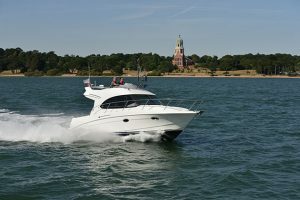 However, a previous owner’s decision to fit a 4kW generator in the stern as well as a hydraulic passarelle had induced a serious tail-heavy trim that required huge amounts of tab to get it to run flat, not to mention a top speed that was 10 to 15 knots below its 48-knot potential. The interior was very dated including a carpet that had seen better days. 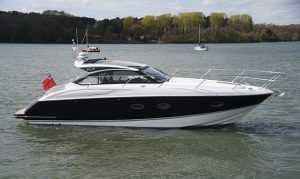 The exterior also had that yellow boot top that Sunseeker used to use back in the 90s, so that needed to go too. I was also keen to look into fitting a gyro stabiliser and it made sense to overhaul the engines, drives and electrical system while we were about it. The cockpit upholstery was in good condition but the nav gear needed updating, as did the sun-faded walnut dashboard and the worn teak on the bathing platform. passion and the encyclopaedic knowledge that I was looking for. 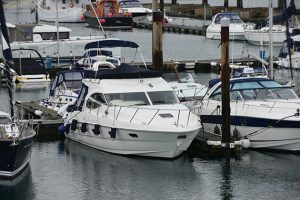 And Landau is based on the Hamble, 90 minutes from home. 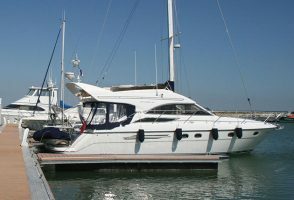 My decision to bring the boat back to the UK was quickly proved to be the right one when I was charged €750 to put her on the lorry in France but only £250 to lift her off the other end. Coast 2 Coast transport did the move, flawlessly and at a competitive price.